Elegant rosewood high gloss piano finish plaque with gold slide-in certificate frame. Slide-In frame has a clear protective window made of Lexan for added durability and protection. Cherry finish laminate plaque with gold slide-in certificate frame. Slide-In frame has a clear protective window made of Lexan for added durability and protection. Solid american walnut finish plaque with gold slide-in certificate frame. Slide-In frame has a clear protective window made of Lexan for added durability and protection. 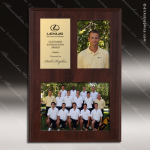 This 9x12 Slide in photo plaque holds both a 3-1/2" x 5" photo and a 5"x7" photo. No nails or screws needed, just slide the photos in behind the clear plastic windows. There is also room for a 3" x 4-1/2" personalized plate. 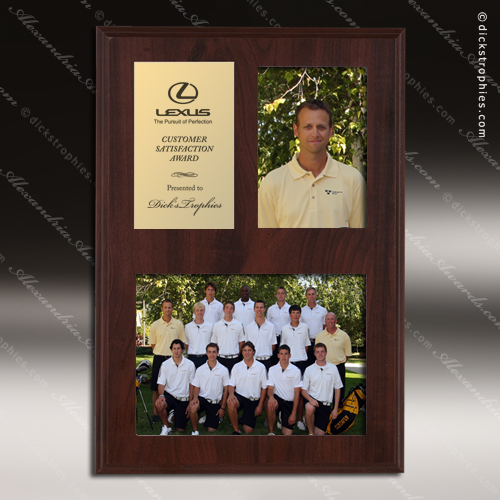 This is the perfect plaque to preserve and display a team photo along with a photo of the individual player. Production lead time for this product is 7 days. This product has a minimum order quantity of 10.